Elton John hosted his 20th Annual Academy Awards Viewing Party this past Sunday to benefit the Elton John AIDS Foundation. This year’s party in West Hollywood Park turned into nothing short of a dazzling runway, complete with some of the world’s most beautiful women like Heidi Klum, Dita Von Teese, Marisa Miller and budding actress, Sadie Alexandru. 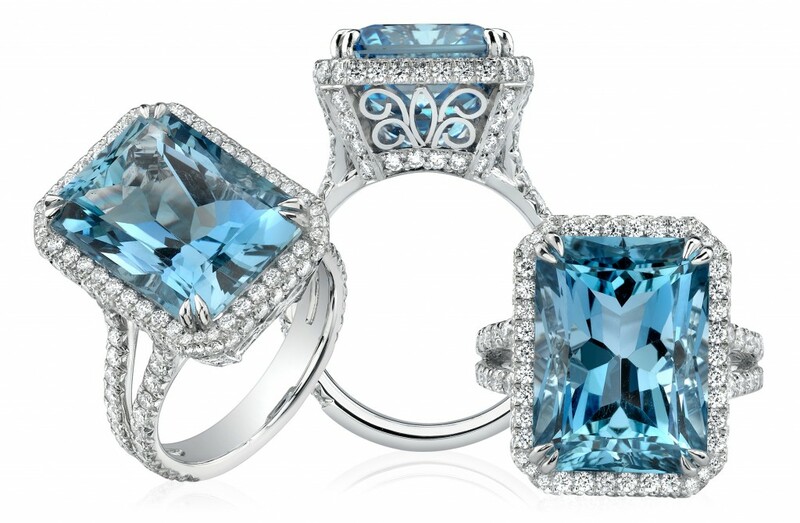 Actress Sadie Alexandru shows off her stunning Omi Gem's aquamarine and diamond ring during the Elton John Academy Awards Viewing Party and fundraiser. Along with luminaries from every industry, Alexandru, who is currently a guest star on the new hit Cinemax series “Femme Fatales” shined in her Omi Gems 11 carat aquamarine and diamond ring. “What a truly AMAZING evening we had last night at the Elton John AIDS Foundation Oscar party where 5.1 million dollars were raised for the AIDS Foundation. We had a blast mingling, eating and dancing with all of the generous and glamorous benefactors. A big thank you Omi Gems for my stunning jewels from their Privé collection!” said Alexandru. John was seated at a table in the middle of the ballroom, where the multi-award winning songwriter sat alongside a blue-haired, happy-looking Katy Perry and Smokey Robinson. Other attendees like Heidi Klum, Liam Hemsworth and Miley Cyrus, David Burtka and Neil Patrick Harris were all buzzing about one important attendee: Elton and David’s son Zachary. At just over a year old, the little man was adorable in a miniature tuxedo monogrammed with his name. Zach was very excited about the chocolate Pomeranian toted by Fran Drescher. 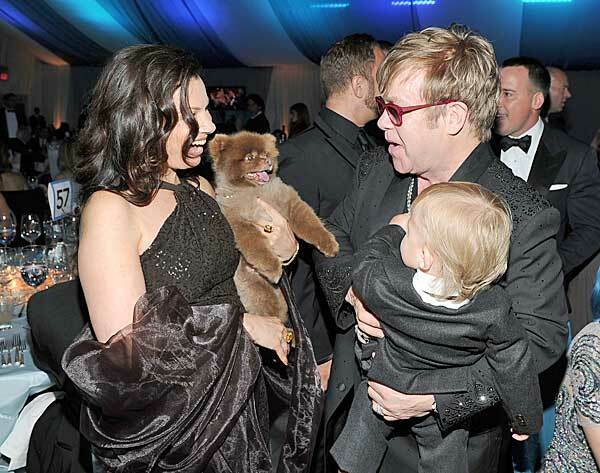 Elton John's son, Zachary, loved Fran Drescher's chocolate Pomeranian. John commented during his post-telecast that Sunday night’s crowd was the largest ever with 910 guests and that he was thrilled to be raising both money and awareness for the prevention and treatment of Aids. Katy Perry and Dita Von Teese were all sparkles with Elton John. This entry was posted in Awards, Celebrity, Gemstones, Press. Bookmark the permalink.